Fresh summer “Oh My God That Was Good” tomato bisque. Although you don’t typically think of having tomato soup in August, I think it’s the perfect time to make it. This is velvety and creamy, high in fiber and low in fat. With my garden tomatoes at their peak, canned tomatoes just won’t do. Serve this with a little fresh basil and some grated Parmigiano Reggiano. Simply delicious! Here are a few of my other summer favorites using tomatoes from the archives; Pasta with Chicken and Grape Tomatoes, Heirloom Tomato Salad, Sauteed Zucchini with Plum Tomatoes, and Tilapia with Tomato Caper Sauce. To peel the tomatoes, boil a large pot of water. When boiling, drop the tomatoes in the water to blanch one minute, or until the skin cracks. Quickly remove from the water, let it cool a few minutes and the skin will come right off. Chop onions, carrots, celery and garlic using a mini food processor or chopper. Melt butter in a large soup pot over medium heat. Add butter until melted, then add chopped onions, carrots, celery and garlic. Cook stirring often until soft, about 8-10 minutes. Add chicken broth and tomatoes, stirring well. Using a string or a rubber band, tie herbs together and drop into the soup. This will make it easy to remove later. Add salt and fresh pepper, reduce heat to low and simmer covered for 30 minutes. until smooth. (A regular blender would work, but be sure to let the soup cool before blending and fill only halfway in the blender so it doesn’t explode on you). Ladle into bowls and top with freshly grated cheese and fresh basil. I bet she didn’t use low sodium chicken broth or unsalted butter. I bet if you switched those two ingredients it would significantly lower the sodium in the recipe. How would you freeze this? Do everything except the sour cream? Or make it completely and then freeze? I love this soup! I make it all the time and take it for lunch. It is so easy and delicious – thanks for the recipe. My last couple of batches I added a container (cup) of plain, low fat Greek yogurt instead of the sour cream. The whole cup only has 80 calories, so I don’t think it changes the total much, but it adds a really great flavor to the soup. Other than that, I make it according to the recipe…every other week! Just made this soup today and it was absolutely delicious! I used canned tomatoes because it’s not quite tomato season yet. I served this with some brown rice and a dollop of sour cream. I will be making this again in the future. I just canned tomatoes yesterday and one of the pints didn't seal…I will be making this tonight but will use fresh basil since I have it. I make a TON of soup. 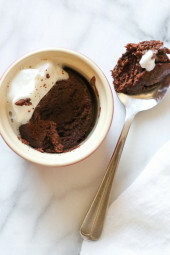 After trying this recipe, I am quite certain this is one of my favorites! I didn't have fresh tomatoes so I used a large can of whole plum skinless tomatoes and a regular size can of diced roasted tomatoes. It was so easy and yet so good. I can't wait to make more! I eat a cup of this almost every day for the past 2 months with my lunch. You'd think I'd get tired of it but no!! I love it that much! Since it's January and we have no home grown tomatoes, I've been using Hunts garlic roasted tomatoes and I also add in some roasted tomatoes from the Deli. I also add in some tomato paste. It is amazing! I double the recipe and let it simmer on low in the crockpot for about 6 hours. 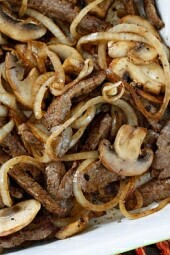 I freeze it in one cup servings which makes it easy to pop into the microwave for a quick lunch. I can't wait to try it with home grown tomatoes this summer (which is why I am tripling the number of tomato plants that I plant this year). This was great soup! Since it's November, and the plum tomatoes are not at their peak, I used a 35oz can of Cento peeled tomatoes instead of fresh and it was still terrific! (1 cube of Knorr Vegetable cube). My kids loved it! Just made this and it was a hit for the whole family. My husband likes a chunkier soup so I added fresh corn right off the cob, fresh parm cheese and basil. Delicious! Now onto the zucchini lasagna! Used all homegrown veggies and herbs for this delicious soup. I saved time and didn't peel my tomatoes, I pulsed them in the food processor and added them to the onion mix. Worked well and tastes great! When I worked at a special investigations unit, there was this little cafe in the corporate building across from ours that served this bisque every Tuesday and Thursday. I patiently awaited those days and raced out to get it as soon as 12:00 came around. That's how I got hooked on bisque rather than the canned soup my mom used to make. This easily topped that, and we couldn't get enough! Topped with a bit of Parmesan, I was in heaven. I served this as a side with your garlic lovers' roast beef sandwich with carmelized onions and provolone and both items were a HUGE hit. I can't wait to make this again! This was delicious!!! I made it last night from fresh farmers market organic tomatoes, celery, and onion and basil from my own garden. It. Was. Fantastic!! Thank you so much. This is definitely going on my regular menu. Do you think this would still be yummy if you don't blend it? I have a very small kitchen and sadly no blender. Will Cherry and Roma tomatoes work for this recipe? Also, can i use the veggies from making homemade chicken broth in this soup, or should i toss them and use a fresh bunch? OMG, I made this today. I used a large can of San Marzano tomatoes because fresh tomatoes are hard to come by this time of year and only used two cups of chicken broth. So fresh tasting…..I loved it! I'm hoping to try this tonight but instead of using sour cream i'm going to try non fat Greek yogurt. Hopefully its good. This was so good and easy to make! I used an immersion blender to blend everything together so I never had to remove anything from the pot. Also left the basil in, which gave it so much flavor! I leave the skins on and use an immersion blender. Works great. And you get the extra fiber from the skins. I freeze my over abundance of cherry tomatoes whole. They work great for this recipe. I can't seem to find good garden grown plum tomatoes in our area. Would it work to substitute a standard tomato (like beefsteak or heirloom)? Gina, this was a great soup! I rarely like tomato soup, but this was great. I tweaked it a bit and substituted the sour cream with a 6 oz. container of fat free plain Greek yogurt and it made it a little creamier…and yummy. Might impact Pts+ but probably not by too much. Thanks for the recipes! do you remove the Basil leaves or blend them in? this looks soo wonderful!! Gina, How do you skin fresh tomatoes? btw love your blog, use it allll the time!! Meg, I only like to make this with summer tomatoes, when they are at their peak. Just made this soup and used canned tomatoes, not terrible but will for sure be making it again come summer when my garden is full of tomatoes. Thanks for all your great recipes!! This is my new go to cookbook!! How many oz of canned tomato did you use? 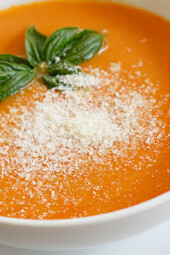 I just came across this recipe yesterday and decided to give it a try, though I'm not huge on tomato soup. I did use canned crushed tomatoes, and it came out great! I got two thumbs up each from my very picky and vegetarian daughter (used veggie broth) and my husband who said he thinks that was the best tomato bisque he has ever had. I like it, too! Went great with a grilled ham and cheese sandwich. Thanks, Gina! Always, always love your recipes! I just made this for the first time and it tasted amazing! Definitely putting it into my soup rotation for sure! If it has chicken broth, it isn't vegetarian. So, it probably shouldn't be under your vegetarian list. Just saying. right, vegetarians should use vegetable broth. Made this soup tonight with fresh tomatoes from my garden (some roma, some regular). I only had about 24 oz of tomatoes so I did about 3/4 of the recipe.I used sunflower oil instead of butter, kept the herbs the same but used dry parsley and left my basil leaves in. I omitted the sour cream. After mixing, I added cooked brown rice (1/2 cup dry). This soup was DELICIOUS. Everyone in my family loved it. 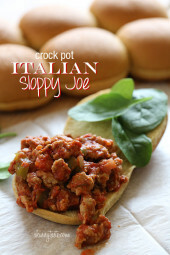 It smelt like bruschetta while it was cooking, it was just an all around awesome recipe! Thanks! I used a hand blender and it still came out chunky. The consistency was off and even though it tasted good I just couldn't get over the consistency. I don't own a regular blender so it will have to stay as is. I was wondering how it would taste with a little dill. A small cafe around here makes the best tomato dill soup. Yummm. My boyfriend declared this the best tomato soup he had ever had! I agree. Didn't have fresh basil or parsley … added dried basil and a sprig of fresh rosemary. Super good! I just made your recipe for the homeade chicken broth. Can I use the onion, carrots, and celery from that recipe to make the Tomato Bisque? What hand blender did you buy? I never have that problem with mine, it always comes out smooth. So I just made this tonight – it was very very tasty! There was one problem though. I went and bought the exact hand blender that you linked to from the post, and it didn't blend it completely! There were little bits all in it, it was too brothy, and just not as enjoyable. So I poured the entire thing into the regular blender and liquefied – and it turned out much better! Great Beth!! I probably won't make this again until the summer, there is nothing like fresh garden tomatoes! If you don't have a hand blender, then you should use a regular blender, it should be smooth. Blending it will make it thicker. Did you use fresh tomatoes? My veggies in the soup turned out a little chunkier than what I expected. I made sure to cut up my veggies fairly thin and small…perhaps a hand blender would be best–I don't have one and used my blender. I also was hoping that this would be more of a "bisque" and not "broth". It seemed a little thin. Did I do something wrong? Isn't it! I've been wanting to make this again to freeze for lunches. Maybe this week! AWESOME! I still got soup all over my kitchen with my blender because I am graceful like that, but it turned out great. I made a batch to eat while I am on a liquid diet for some medical tests. at least I won't be deprived of great taste! @Allison – With dried herbs, you can use less. Start with half, then add more to taste. @Mel – Yes, I chop them the tomatoes large chunks. Do you chop the tomatoes with the other veggies? I wasn't sure how finely to chop them. Thanks! I'm looking forward to eating this. If I wanted to make this with dried parsley and basil and leaving it in the soup rather than buying the fresh herbs and removing them . . . how much of each would you say I should put in? It looks yummy! I can't wait! I suppose you could use canned tomatoes, but I think fresh tomatoes would be so much better. Especially now when tomatoes are at their peak. This soup is absolutely AMAZING! I followed the directions precisely, except I used dry herbs in the soup itself rather than tying off fresh ones for added flavor & color. I did have dry bay leaves on hand so I removed those when the soup was done simmering. I found a new favorite soup! 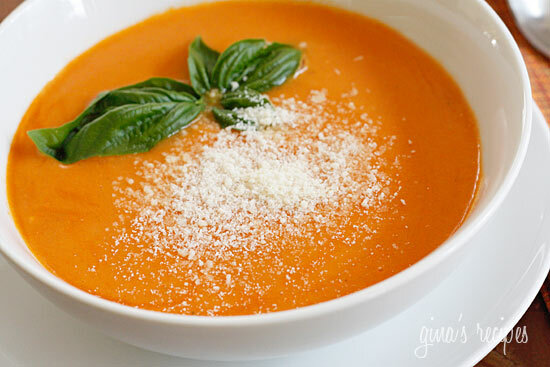 Simple but incredibly good – tomato soup is one of my favorites! And I agree, might as well make it when tomatoes are naturally ripe! Do you think it'll taste the same with whole canned tomatoes? I could go to the Farmer's Market and buy some but………..if canned works, why not? @Suzy- It's hard to say since I used a variety of sizes and tomatoes. I weighed it after I removed the skin. If you don't have a scale, keep in mind that a large can of tomatoes is 28 oz, so judge by that. Maybe 8-10? @Joanne, thanks! Of course that's ok, I appreciate it. @Jennifer, no the cheese is extra. My husband didn't think it needed cheese so it's up to you if you want to add it. I think it's a must! @Laura- I basically blanch them, remove the skins and put them in gallon freezer zip lock bags. Works great! Is it really necessary to remove the skins? I normally cook tomatos skin on, especially if I'm pureeing later. How do you freeze your fresh tomatoes to use later? Does the 2 points per serving include the Parmigiano Reggiano, or do I need to add a point? Wow this sounds like heaven! i'm going to give it a try for sure. I shared your blog with my Weight Watcher group today. Hope that was ok. I'm sure many will be popping in to read all the wonderful food you make. approx how many tomatoes = 30 oz? Is it really 2 cups to the serving? (2 cups = 2 points)? I would buy ripe tomatoes if possible or use San Marzano if I must. I plan on freezing as many tomatoes as possible from my garden to use throughout the year. Maybe one day I'll learn how to can! Gina, what type of canned tomatoes would you substitute in the wintertime? Can't wait to try this one. My tomatoes are already gone, but I have them in the freezer for use. The basil is everywhere so this will make a quick supper for us soon. Basil and Bay leaves are very different and have completely different flavors. Bay leaves are hard to find fresh, I usually buy them dry. @Sally- Yes you could, but I think the flavor of the butter adds to the soup. @Jennifer, sure vegetable broth would be fine for vegetarians! This is definitely a winner and a keeper! I was wondering what to do with all those plum tomatoes I have in the garden. However, hot soup in the midst of a mediterranean heatwave??? So, I'm going to replace butter with olive oil and leave out sour cream ( will mix it in when serving) and make it and preserve it in jars for the winter ( just like when making jams!) Oh boy! Are we going to have fabulous tomato soup this winter! I need to start making my own tomato soup–it's SO much better than canned. I have a ton of tomato's but hot soup just isn't my thing in the summer. I wonder if this would freeze well?? what a treat for a cold winter day! Hi Gina, can olive oil be used instead of butter. Looks very good. Have to try this one! completely different herbs. basil can be processed and eaten, bay has to be removed. it looks great! I just made a tomato soup yesterday too. I love serving it with a sandwich thin toasted with melted pepper jack cheese in the middle. A bowl of soup + my low cal cheese sandwich is only 5 points total! So delicious!! !